The Apple Watch is Apple’s first foray into a wearable product. When it was introduced in September of 2014 it was intended to be capable of replacing many of the functions of the iPhone. However, as the Apple Watch got into users hands, and after getting feedback Apple has reduced the overall scope of the Apple Watch to be more narrowed. watchOS now focuses on two major areas, Notifications and Health. I have owned an Apple Watch since the beginning and have used each generation of the Apple Watch, including the latest, the Series 4 Apple Watch. Here are my thoughts on the Apple Watch after about two weeks of usage. The Apple Watch Series 4 is the biggest redesign of the Apple Watch since the original, retroactively dubbed the Series 0. These changes somewhat mimic the redesign of the iPhone. The iPhone also saw its first radical redesign with its fourth release, the iPhone 4. The Apple Watch Series 4 comes in two sizes, a 40mm screen and a 44mm screen. These screen sizes are larger than the 38mm and 42mm options, which have been the sizes for all previous Apple Watches. Open the Apple Store app<. Tap on an Apple Watch model, it does not matter which one. Tap on “Compare Sizes” directly underneath the two sizes. Here you can actually place some paper on top of your iOS device and you can trace around the Apple Watch sizes and then you can place these on your wrist to see how well each size would fit on your wrist. This is the approach I used in order to determine which model I would buy. Ultimately, the 44mm was the right choice, for me. Here are the two Apple Watch sizes. Next let us look at the actual size differences. 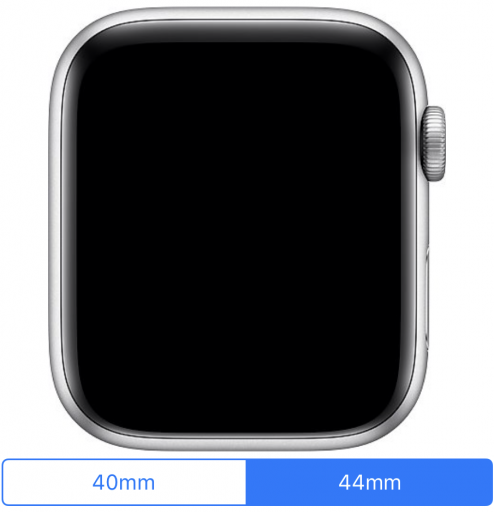 When you think of the difference in size, 42mm vs. 44mm you would think that it is not a lot of space. 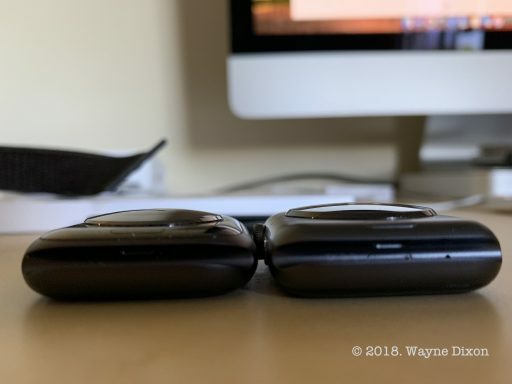 However, the 44mm Apple Watch Series 4 screen is actually 32% larger than the 42mm version. The difference is not just noticeable, but quite welcome. Having al larger screen size makes everything easier to do, from tapping buttons to just being able to quickly glance at information. It really does make a difference with the larger screen. With a difference in screen size you might think that it would be a bit odd having a larger screen than before on your first, but you quickly become accustom to the size difference. There are a few different ways that Apple Watch users can personalize their Apple Watch. The first is through the choice of watch band. In the last 3 1/2 years many users have amassed a number of different watch bands. The Apple Watch Series 4 allows existing watch bands work with the new watch, with a bit of a caveat. In particular the 38mm bands work with the 40mm watch. Similarly, the 42mm bands work with the 44mm Series 4 Watch. This means that all of your existing bands will work, provided you upgrade to the corresponding size. 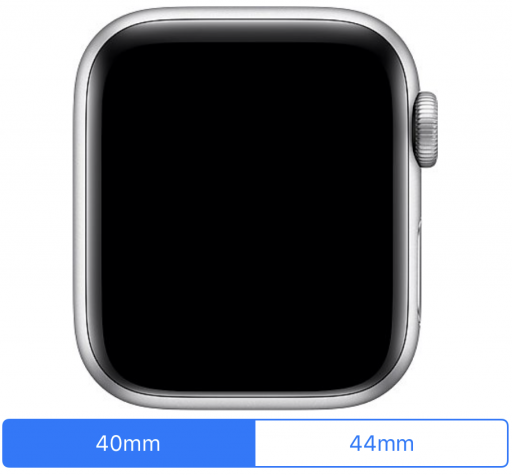 This is important to note because Apple’s site only shows 40mm and 44mm options and third-party sites like Amazon may have 38mm and 42mm sizes listed. 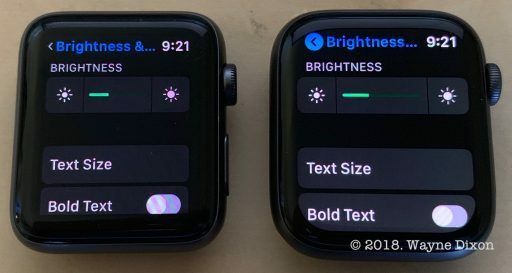 The second way that users can make an Apple Watch their own is through the watch face that they choose, and there have been some additional options for watch faces. Let us look at some changes around watch faces now. watchOS 5 brings a number of new watch faces, four in total. 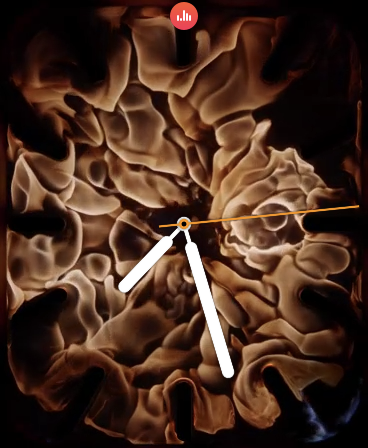 These new faces are Fire & Watch, Liquid Metal, Infograph, and Infograph Modular. These are broken down into two groups, Materials and Infograph. Let us look at these two groups in turn, starting with the Materials. The Fire & Water watch face and Liquid watch faces share some traits. The first is that there are different colors to choose from in each watch face. For Fire & Water you can choose between two materials, fire and water. With Liquid Metal there are three colors, Silver, Gold, and Black. These colors match the available colors for the Watch as well as the iPhone XS. Also with both the Fire & Water and Liquid Metal faces you can select if you want to rotate between the options or just stick with a single option. Besides the color selection you can also choose whether to use a Full Screen or Circular watch face. If you opt for Full Screen, you cannot set any complications. 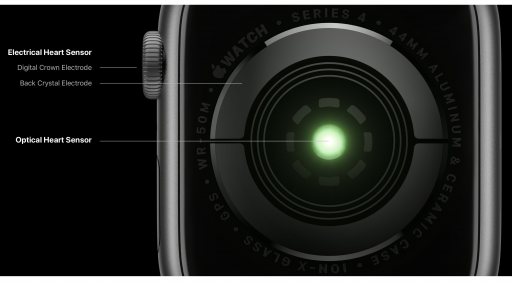 With the Circular faces you have three complication options, upper left corner, upper right corner, and the bottom. The two upper complications are circular while the bottom complication is one off the new rounded complications that typically include a line of text. These two watch faces are great if you want to use a watch face that only tells time, yet can take advantage of the smart aspects to the Apple Watch to provide a bit of animation. Let us now look at the other new watch faces. These two faces are “Infograph” and “Infograph Modular” and with these even more information can be shown. Let us start with Infograph. The Infograph watch face is an analog watch face, with hour, minute, and second hands. The Infograph watch face allows you to customize the color with over 50 choices, including using a white watch face. Besides the color you can customize up to eight different complications. There are the four corners which provide curved complications, and the four inner complications, called “sub-dial” complications. The sub-dial complications are the standard circular complications that most apps contain. You can use all of none of them. There are a lot of built-in complication options available. The entire list of available complications include: Activity, Air Quality, Alarm, Battery, Breathe, Calendar, Date, Digital Time, Earth, Favorite Contacts, Heart Rate, Monogram, Moon, Music, Reminders, Solar, Solar System, Stocks, Stopwatch, Sunrise/Sunset, Timer, UV Index, Walkie-Talkie, Weather, Weather Conditions, Wind, Workout, and World Clock. 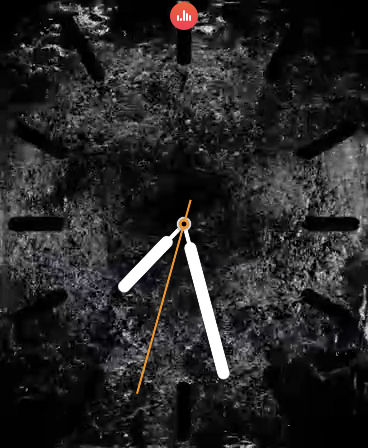 One of the unique aspects to the Infograph watch face is that the complications in the corner can be curved to follow the watch face itself. These curved complications are not limited to the Apple native complications, but they are available for third-party applications to use as well. With the ability to set up to eight different complications, the choices can quickly become overwhelming. 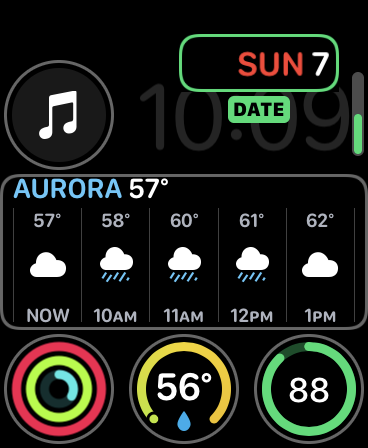 If you opt to use the Infograph watch face, start with only one or two complications and then add more as you need more information. Let us now look at the Modular version of Infograph. There is one watch face that many would consider the definitive “Smart Watch” and that would be the Modular watch face. The reason is because all of the information that you can see at a glance. The Infograph Modular face is very similar to the regular Modular face. The Infograph Modular face also shows a lot of information. You can have up to six complications on the Infograph Modular face. The available complications are: Activity, Air Quality, Battery, Breathe, Calendar, Date, Earth, Favorite Contacts, Heart Rate, Moon, Music, Solar, Solar System, Stocks, Timer, UV Index, Walkie-Talkie, Weather, Weather Conditions, Wind, Workout, and World Clock. With the Infograph Modular face the upper right complication can only be the current date or off. 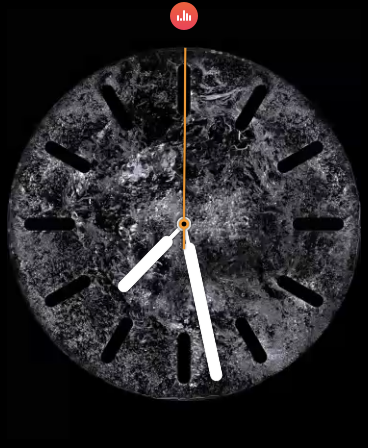 Just like the traditional Modular watch face, the time cannot be changed and is in one spot. Just to the left of the time is one of the four icon-sized complication areas available. The other three are at the bottom of the screen. The last complication area is reserved for large complications. The available options for this area are: Activity, Calendar, Heart Rate, Stocks, and Weather conditions. There are a number of complications that is available on the standard Modular watch face that is not available on the Infograph variant. Some of these make sense, while others do not. The one that seems like it is missing, to me anyway, is the “Now Playing” complication. 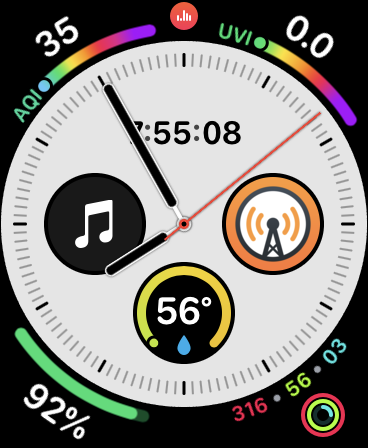 The Now Playing complication allows you to see the currently playing audio. With this complication enabled, if you tap on the currently playing audio you will be brought to an interface that will allow you to adjust the volume, skip to the next or previous item, as well as play and pause the audio. 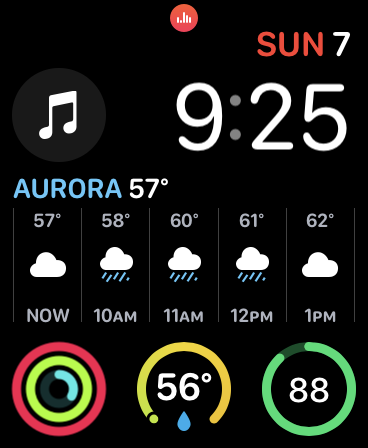 I know for me this is a deal breaker with using the Infograph Modular watch face. This is only because when I am at work, I am typically listening to music. While I can often know which song is playing, there are times that I do not know. 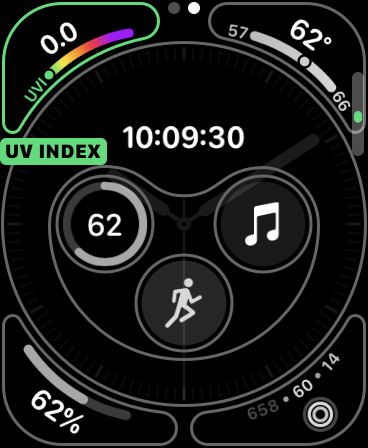 Hence, I need to be able to quickly glance and see which song is playing and the Now Playing complication on the Apple Watch is best at doing this. Alternatively, I could tap on the iPhone XS screen and see the current song, however that is not possible if the iPhone is not nearby. 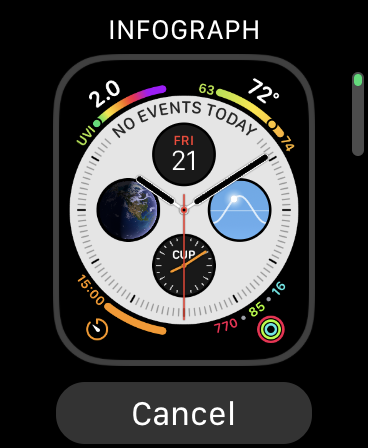 It would be really convenient to have an option for the Now Playing complication to be used on the Infograph Modular face. 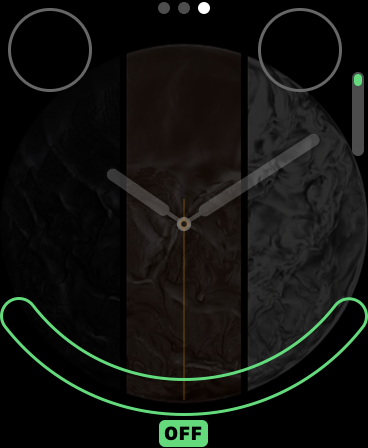 There is a handy guide for the Watch Faces and which ones are available at https://support.apple.com/guide/watch/faces-and-features-apd6ce85daf4/watchos. Now that we have covered the new watch faces, let us turn to another piece of the Apple Watch that has been updated, the Digital Crown. 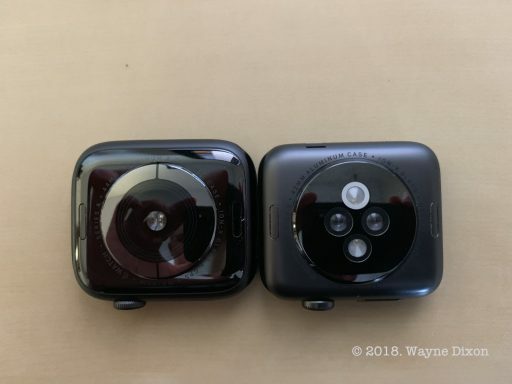 The Digital Crown on the Apple Watch Series 4 is entirely different from the Series 3 and earlier models. The Digital Crown has two new distinct features. The first is that the Digital Crown now provides haptic feedback. This is most present when scrolling long lists of items, such as your app list, music, or adjusting the volume. This is quite helpful for allowing you to know the you get to the top or bottom of a list of items. Along with this, it is useful for accessibility for those to be able to know when an action is occurring. The second new feature that the Digital Crown on the Apple Watch Series 4 is that it can be used as the mens for completing the circuit for the included Electrocardiogram. The way that this works is by creating a circuit between the Crystal electrode on the back and the electrode on the Digital Crown. The ECG sensor is designed to possibly detect the appearance of Atrial Fibrillation, more commonly known as Afib. There is a great explainer about the health aspects and an explainer about Afib over at Tidbits. This explainer is by a paramedic and well worth the read. The fact that there is a way to detect Afib using a device that is right on your wrist will definitely help save lives of many individuals, beyond the ones that have numerous accounts of how the Apple Watch has saved lives. Currently the feature is not available, but Apple states it will be “available later this year”. It would not be a surprise to see additional health features come to future versions of the Apple Watch. So, you should take note when enabling Fall Detection, particularly if you do some high-intensity workouts. Unlike the iPhone X, the Apple Watch Series 4 is more expensive than its predecessors. The 40mm GPS Model starts at $399, while the GPS + Cellular model is $499. The 44mm prices are $429 and $529 respectively. Similarly, the price of Apple Care has also increased, from $49 to $79. This means that the overall cost has increased $100, if you include Apple Care. This increase will definitely mean more revenue for Apple. There are just a couple of other tidbits that should be noted. Apple has never really discussed the amount of storage available on the Apple Watch, but with the release of the Series 3 GPS + Cellular model, the storage was 16GB, while the GPS-only model was a mere 8GB. With the Apple Watch Series 4, all models now have 16GB of storage. The Apple Watch has been used by many for water sports, well before it was advertised as being water resistant. The Apple Watch Series 4 is now rated as IP 68, which means it will be able to submerged in 2 meters of water for 30 minutes, this is up from IP 67, which is 1 meter for 30 minutes. The Wireless within the Apple Watch is still 802.11b/g/n at 2.4GHz, but the Bluetooth connectivity is now Bluetooth 5.0, instead of Bluetooth 4.2. The Apple-proprietary wireless connectivity uses the W3 chip, the next generation of their wireless chipset that was introduced with the AirPods. The next tidbit is that the Apple Watch Series 4 can detect low blood pressure. It will provide a notification if your heart rate falls below 50 beats per minute for 10 minutes, in addition to the existing high blood pressure, which is 120 beats per minute for 10 minutes, without being in workout mode. The last tidbit is that the red dot that indicated that a model was Wireless has been reduced to a red ring, this is because of the need for good connectivity for the ECG sensor. Overall the Apple Watch Series 4 is a worthwhile upgrade, provided you have an Original Apple Watch, a Series 1 or even Series 2 Apple Watch. The larger screen sizes will make interactions easier as well as provided more information on screen. 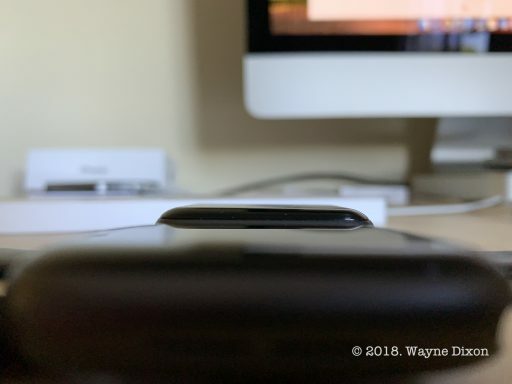 Even with the larger screen, the overall depth of the Series 4 Apple Watch is thinner and it is noticeably so. 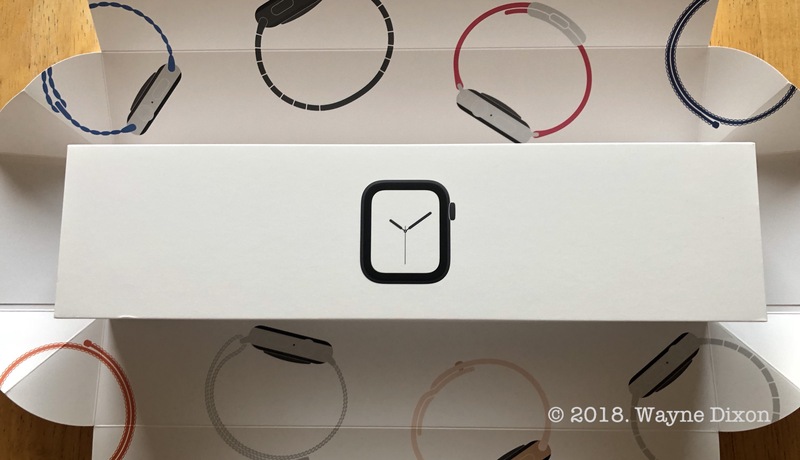 If you are upgrading, you will be able to use your existing Apple Watch bands, from your 38mm watch, if you go to the 40mm version, or your 42mm bands, if you go to the 44mm Apple Watch. If you have considered getting a Smart Watch and you have an iPhone, you cannot go wrong with the Apple Watch Series 4. Whether you choose the GPS-only model, or the GPS + Cellular model, you will be able to use all of the new features while on the go.